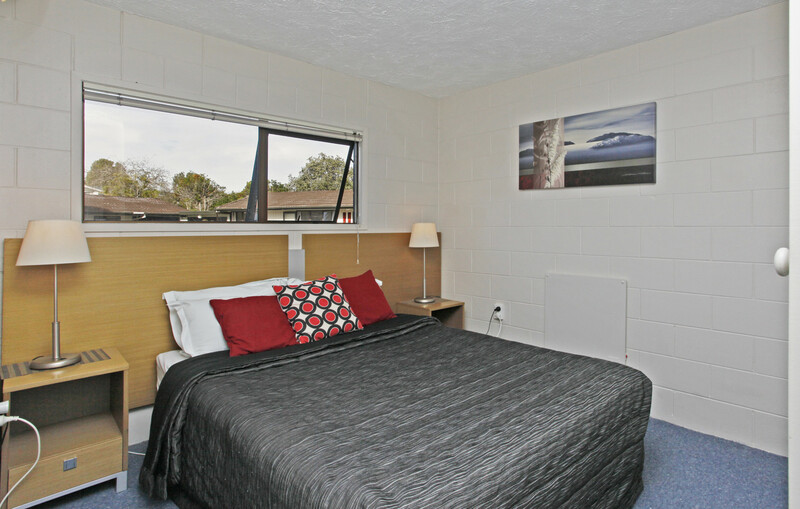 Walton Park Motor Lodge offers clean and comfortable motel accommodation in Warkworth, Auckland, New Zealand. 2.5GB of free Wifi upon check in. Further data can be purchased from reception. Function Room – Available for conferences, workshops and interviews upon request. *Special accommodation prices are available by request for group bookings or long term stays. Located on the ground level, our quad studios offer one queen and two single beds in an open plan layout, plus ensuite bathroom. Each quad studio is equipped with a small kitchenette. MAX. 4 PERSONS. Located on the ground level with parking directly outside, the two bedroom units offer a double bed, two single beds, small dining area and kitchenette, plus bathroom. Ideal accommodation for a group travelling together. Located on the upper level, our triple studios offer one queen and one single bed, in an open plan layout, plus ensuite bathroom. Ranch sliders open onto a secure private deck area. Each triple studio is equipped with an electric kettle and mini fridge. MAX. 3 PERSONS. Ideal accommodation for an overnight stay, our standard studios provide the option of a queen bed or twin singles in an open plan layout, plus ensuite bathroom. Each standard studio is equipped with an electric kettle, toaster, microwave and mini fridge. MAX. 2 PERSONS. Ideal accommodation option for a large family group. Located on the ground floor with parking directly outside, the 3 bedroom unit offers one queen bed, one king single and two singles. There are 2 comfortable couches, plus a dining area which comfortably seats 6, plus bathroom. Equipped with a full kitchen with a stove and free standing fridge freezer. The dining area opens onto a private patio.